I was stopped out of SKF and bought UWM and DDM, which are ultra long the Dow 30 and Russell 2000. Looks like this might be the capitulation bounce we’ve been waiting for. Update: A few readers have asked how I timed the DDM trade so perfectly. I should have posted my entry prices. I did not buy at the bottom. I ain’t that good . . .I bought toward the end of the day at an average price of $70.57. Heh. 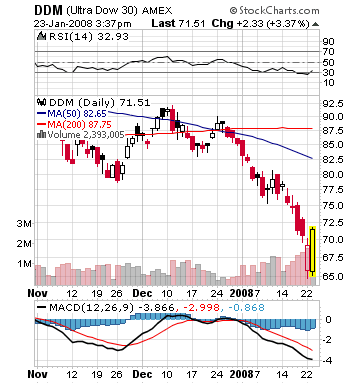 I made that same DDM trade – although I waited until after we cleared yesterday’s range before jumping in. Better entry would’ve been after the second bounce from yesterday’s low. Oh well.